With all the construction work I've done on my station this year I have gained some wanted, and unwanted experience with a variety of products. Rather than keep it all to myself I will give a concise review of several of these. Almost all are brand specific, with a couple of exceptions. Since my experience with these and competing products is limited don't solely rely on what I have to say. Look around and you'll find other, perhaps better products and other opinions. Be sure that the reviews you listen to are informed by actual use, preferably over the long term. Let's get one stinker out of the way. 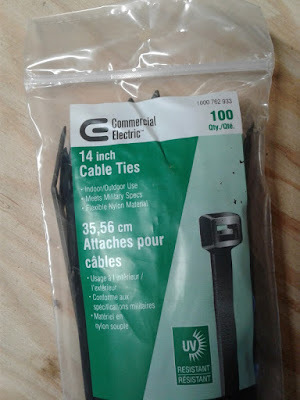 Over the years cable tie quality has improved quite a lot, especially those most common in the retail market. Countless cable ties litter my antenna farm to hold thousands of feet of all types of cable, near the ground and on the tower. Many work well, but there are exceptions. Strolling down the electrical aisle of a well known big box store I noticed the rack of cable ties. Since I go through so many I grabbed a couple of packages of an unfamiliar brand, though reasonably confident by the description and the store's generally favourable reputation. It didn't work out. Break at a right angle bend around steel tower legs. Other brands never did this under the moderate tension applied while tightening the cable tie. Torn strap during handling or when pulling on the free end to tighten it. Failed tooth in the ratchet box. Despite one bad brand be careful not to dismiss unknown brands. I have had good success with black cable ties manufactured close to home or in Asia, and even house brands of reputable stores. Since this is a new station the cable ties have at most survived one full cycle of seasons. I am not yet confident enough to recommend a specific product. But as you can see there is one I can warn against. Earlier this fall I ordered a variety of DXE saddle clamps and Cycle 24 galvanized muffler-style clamps from DX Engineering. I used 3" saddle clamps (both 5/16" and ⅜" bolts sizes) in the modified boom-to-mast clamps for the TH6 and XM240 to attach to the 2.875" mast turned by the prop pitch motor. The Cycle 24 clamps I've used everywhere from boom trusses to mast steps and as mechanical aids for tram lines anchors and to hang pulleys for heavy lifts. Aside from one incidence of user error (that's me) that galled one of the stainless steel u-bolts I am very satisfied with both products. They're easy to use, quality appears excellent and they have excellent holding strength in comparison to common galvanized muffler clamps. The winds have been blowing hard on top of the big tower, the temperatures have plummetted and neither yagi has budged. 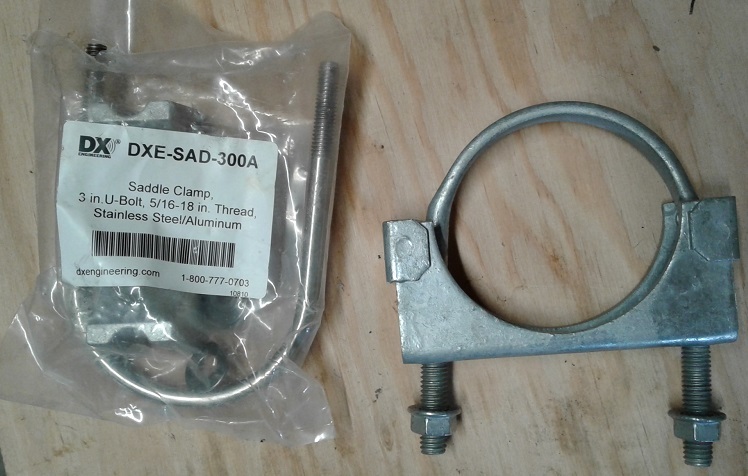 The only complaint I have is that the stainless flat washers that come with the saddle clamps are thin and weak. They distort easily, and especially if the clamp surface isn't perfectly flat. I had this occur on the TH6 boom splice and mast clamp where there is a narrow flat surface on the inner side. The difficulty was resolved by removing the flat washers. The lock washer now sits directly on the aluminum surface. The Cycle 24 clamps that I used and reused several times have not distorted due to asymmetrical loads and the galvanizing remains intact. Bolt threads have withstood heavy leaning on the nuts with a big wrench. They're inexpensive and I keep a few in my toolbox for odd jobs. A 2x8 antenna switch walked up to me at a gathering of contesters and asked me to buy it. I did. Well, that's almost true except the walking and talking was done by the device's owner. Hamplus has a good reputation and the price was right so I bought it, thus advancing one part of my station automation plans for SO2R and multi-op. It's designed for outdoor and indoor use. I wanted it outdoors so that's where it went. With a few lengths of pressure treated lumber and a handful of hardware I affixed it to the side of the Trylon tower under a simple weather cover. It is now working just fine along with the manual control unit I built for it. Putting it outdoors reduces the mess of coax coming into the house, yet is readily accessible for maintenance. So far it is working well. 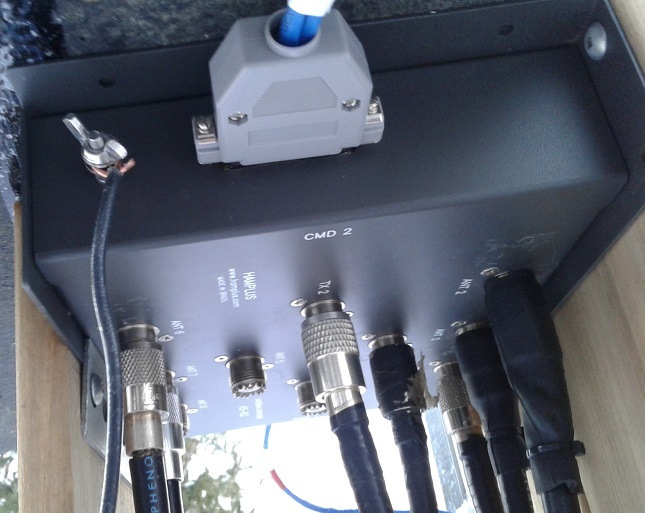 It has one flaw that prevents selection of one of the antennas from one of the two sides. I don't know if the short of adjacent lines from the connector is that way from the factory or due to abuse. Unfortunately the fault is on the underside of the board which can only be accessed by removing a multitude of almost inaccessible fasteners securing the 10 SO239 jacks to the chassis. This is very annoying. I haven't made the attempt as yet and perhaps I never will. So for now it's a 1x8 + 1x7 switch. Also annoying is the skimpy and inadequate documentation at their web site. There one can find the pin out for the DE25 connectors but not how the switching is to be accomplished. That is, to select an antenna is the pin grounded or powered? Of course if you use their controllers you don't have to know, but that is not what many contesters do, opting for custom hardware or software control. A conversation with the seller (who also didn't use a Hamplus controller) eventually resolved the issue: ground the pin to select that antenna. Nice switch, unpardonably poor documentation. Worse, the AS82N isn't documented at all so I had to rely on a similar product and compare that with what I found under the hood. The more expensive your cable and equipment the more important it is to protect them against the elements. Don't skimp! This is not the place to save a few dollars when it comes to protecting low loss, expensive coax and outdoor electronics for switching and control. Do it right. Cheap vinyl tape has its place in the great outdoors but not to seal a connection that must not leak or allow incursion of damp air (condensation and corrosion). I have nothing unique to offer in this regard since many have already said it. Yet too many hams don't listen. You decide. Use a sealing tape around every joint, whether fixed (e.g. coax entry at back of connector) or movable (e.g. male coax connector head). Don't rely, for example, on the rubber gaskets found in N and Heliax connectors to protect you. Assume that every inadequately protected joint will fill with water, moist air or pollutants. Over months and years it will certainly happen. 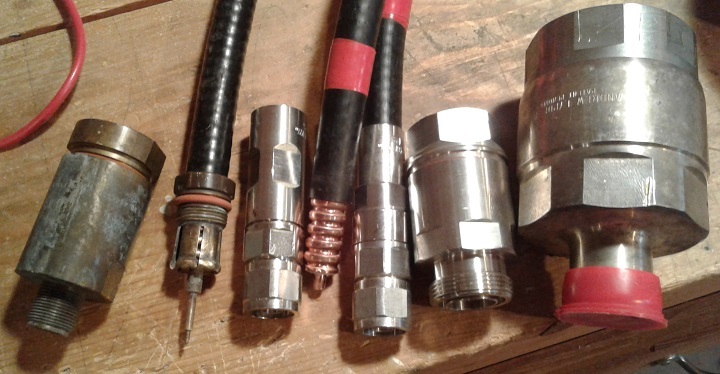 In larger gaps I use an underlayer of Coax-Seal (not shown). I protected the back of every Heliax connector with this additional layer. I avoid Coax-Seal on the connector ends since it can become gooey and difficult to remove when disassembled years later. Temflex rubber tape (third from left) can be difficult to wrap but appears to work well. I bought this roll from DX Engineering but it or similar products are available where electrical supplies are sold. It sticks together by self-adhesive rather than an adhesive coating. I have a similar product from another major brand that I have not yet used and so cannot yet compare to Temflex. The self-vulcanizing tape (second from left) is thin and stretchable, and is easier to handle than the Temflex. I have yet to have a seal fail with this type of tape. Be careful not to overstretch or tear it. I've used both this and the Temflex in freezing temperatures without problems. On the left is a good quality name brand inexpensive vinyl tape. If you do use it try to avoid using this or (often lower quality) no name or house brand tapes as the outer layer. Few can withstand years of exposure. The worst have such poor adhesive or flexibility that it will soon unwrap on its own. The Scotch 33+ or Scotch 88 makes an excellent outer layer. The better tapes are available in wider widths from commercial suppliers. This makes wrapping and protection much easier. Old Heliax connectors I've scrounged that are covered with wide tape are clean and dry after years of exposure. When I refurbished a heavily corroded Hy-Gain Tailtwister rotator (T2X) last year I switched to synthetic grease. Unlike any petroleum based grease I've used the rotator turns as easily at -20° C as it does at +20° C. I'm sold. We'll have to see how it performs over longer periods. I have no particular brand or type to recommend. Look around in any auto parts store and you'll find many varieties. Although synthetic grease can be expensive you don't need a lot and it comes in small packages. When it comes to expensive Heliax connectors sometimes beggars can't be choosers. If you do have a choice I recommend the modern single-piece connectors over the two-piece connectors. Below you see a selection of both types. On the left are used two-piece connectors for LDF5 and LDF4. Particularly annoying are the centre pins of the LDF4 two-piece connectors which are soldered onto the solid centre conductor. It's difficult, hot and messy work that is also hard on the foam dielectric. I've done many of these years past and I hated every moment. LDF5 two-piece connectors are much easier to put on since the centre conductor screws into the hollow centre conductor. One-piece connectors are much easier once you get the hang of the technique. New ones come pre-greased and the best require you to simply trim the jacket, cut the outer conductor and foam at a right angle on a corrugation ridge and cut the centre conductor to a precise length. That done the connector slips straight on and you tighten with two wrenches. It's the same procedure on all the connectors shown: LDF4 N-male, LDF5 DIN-female and LDF7 DIN-female. Peppering you with advertising and installation of unwanted software applications. Automatic restarts (surprise!) in the middle of a contest (or rag chew) to apply urgent (?) updates. Gives software update downloads highest priority, making your other uses of the internet (e.g. spots and RBN) slow to a crawl. Occasionally replace proper device drivers with the wrong ones after updates. Shuffle the COM port numbers after some major updates. Intrusive windows that pop up and demand your attention and action when you're running Europe at 5 QSOs per minute. There are cures available for most or possibly all the problems, but what a hassle. I think I've got my new shack PC suitably configured, for now at least. For example, while I was typing this article I heard a click and turned around to notice that the shack PC had shut down all my applications (including my logging program and Telnet connection to monitor 160 meter activity), started applying updates (of unknown type) and then did a restart. I think I now have that problem solved. At least I hope so. Unless you are willing to do go through some aggravation to research and apply fixes, including some that are quite arcane, I recommend sticking with Windows 7. Apple and Linux are not viable alternatives for many of us since most ham software is Windows only.